This post from The Washington Post's All We Can Eat food blog had me craving chickpeas last week. I thought it sounded like a good accompaniment for Monday-night-fish-night. And I was right. The dish was wonderful with salmon. I made a couple of substitutions: bacon for pancetta and kale for Swiss chard. I also added some olive oil, since the dish seemed a little dry by the time it was done. I guess this is as good a time as any to print my broiled salmon recipe. It's one of the few recipes from my South Beach Diet days that I still make and really enjoy. Simple, fast and delicious. The recipes below make two servings. 1. Remove the stems from the kale. Blanch leaves in a boiling water for 1 minute then plunge into cold water. Drain leaves and squeeze out as much water as possible. Roll up leaves and cut into 1-inch strips. 2. Heat a large skillet over medium heat. Cook bacon until fat renders and bacon is lightly browned. Drain off most of the bacon fat (leave bacon in pan). Add onion to pan and sauté until lightly browned. Add garlic and sauté a couple more minutes. Season with salt and pepper. 3. Add chickpeas to skillet and cook until they are lightly browned on the outside, about 10 minutes. Add cooked kale and stir to reheat. Toss with olive oil. Serve as a side dish. 1. Preheat broiler on high setting with rack in highest position about 4-5 inches from broiler. 2. Combine garlic, olive oil, lemon juice, rosemary, salt and pepper in a bowl to form a thin paste. Place salmon fillet skin side down on a cookie sheet sprayed with olive oil. Spread garlic paste over top of salmon. Broil about 10 minutes, flipping after first 5 minutes. Discard skin and serve. The salmon with chickpeas and kale WAS really good. I've enjoyed your recent salmon experiments! I'm glad. 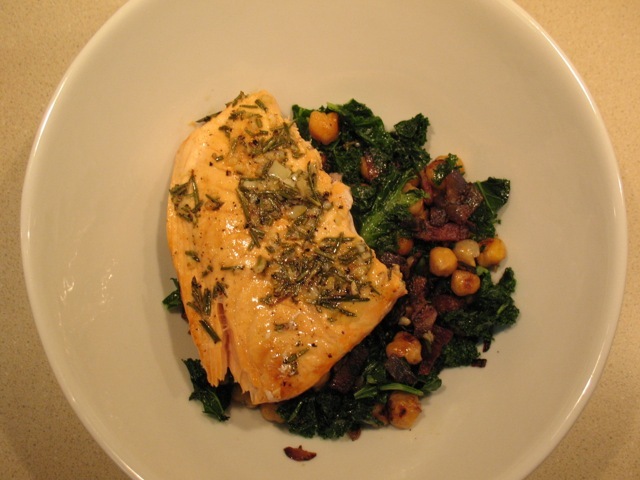 I know you were tired of the usual broiled salmon with garlic, lemon and rosemary. I want to do something with lentils soon.